Exploring the history and potential of books in new, hands-on lab. 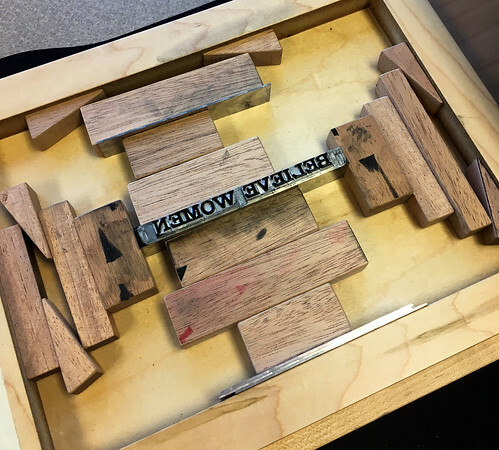 On the third floor of Tawes Hall, I witnessed people huddled around a large table assembling tiny, metal letters to make their own prints using an old-school letterpress. With their inked-stained fingers and bustling conversation, they are breaking stereotypes about English, starting with the myth that the book is dead. In fact, the book has never been more alive. BookLab, a new interactive space established by the English department at the University of Maryland, includes a letterpress and book collection that showcases the history and diversity of books, ranging from early manuscripts written on animal skin to interactive texts made with electrical circuits. Eventually, the lab aims to provide resources for students to create their own chapbooks, or prose-filled paper booklets, including its paper and ink. Matthew Kirschenbaum, professor of English, and Kari Kraus, associate professor of English and information studies, are co-facilitators of the space. They both share a passion for disrupting the general perception that we know all there is to know about the limits and potential of books. First, Kirschenbaum pointed to a book in the collection called “Tree of Codes” by Jonathan Safran Foer to describe a process of bookmaking called die-cutting, where phrases and words are cut out to create an entirely new story from the remaining text on the page. The process is carried out using advanced computer programming. Even the name BookLab itself evokes a connection between disciplines—associating a book with a lab. It’s book collection displays the historical relationship between literature and technology by showcasing texts made with everything from letterpresses to computer programs, and giving students the opportunity to experiment with a variety of bookmaking techniques. Kraus’ example, “The Pussycat Said to the Owl” by English alumna Clifford Hichar ’13 M.A. English, embeds electricity and lighting in the book to light up illustrations and make them more dynamic. One page lights up an illustration of the starry night sky through circuitry hidden behind the page, showing how the creative application of technology can transform a reader’s experience. The new space expands opportunities for English majors and supports the department’s goal of giving students a strong foundation in literature and writing, and also preparing them to creatively work with evolving technologies and media. “The space is about expanding the idea of what the English department itself does,” said Kraus. Kraus’ graduate seminar “Technologies of Writing” and undergraduate course “The History of the Book & the Future of Reading” are currently using the lab, as will Kirschenbaum’s spring graduate class. Numerous other classes have already visited. BookLab is located in 3248 Tawes Hall and has public hours on Monday and Tuesday, 11 a.m. to 4 p.m., Wednesday 2 to 5 p.m. and Thursday 9 to 11 a.m. You can follow them on Twitter and Instagram at @umd_booklab to learn about the various events hosted throughout the year or contact Kirschenbaum and Kraus at booklab@umd.edu.